This story was produced as a project for the USC Center for Health Journalism’s California Fellowship. 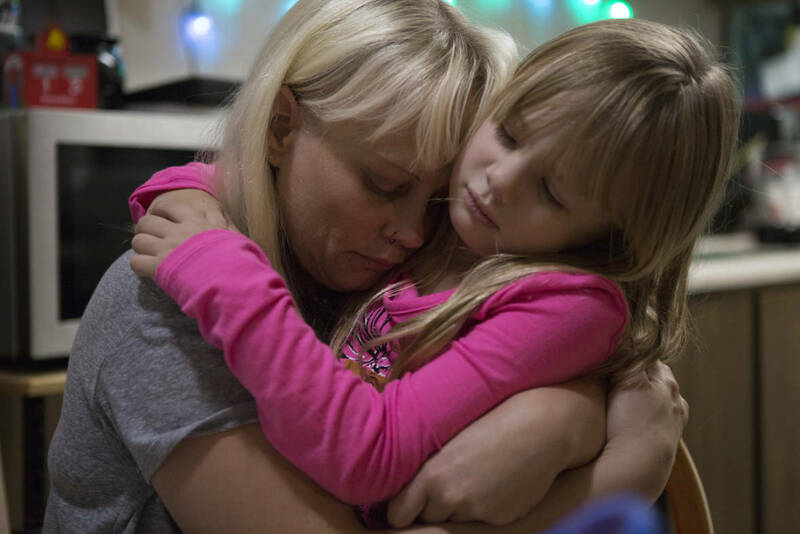 Sabrina Hanes and her daughter, Aroara, stay with friends in Chico following their evacuation from their home in Paradise during the Camp Fire on November 13, 2018. Hanes and her daughter escaped the fire with only two small backpacks of clothes and a few belongings, including a photo album. The home they rented for years burned down. Sabrina Hanes has faced a lot of trauma in her life, most of it in her childhood. As part of her healing, she moved to a Northern California town called Paradise. There she built strength and community, but that was upended when the Camp Fire tore through Paradise, burning her home and turning her life upside down. I followed Hanes through her daily routine in Paradise last summer, to learn how she’s developed resilience. I then caught up with Hanes after the fire to find out what happens next. Sabrina Hanes kicked off the ground, pulling herself up onto a spinning hoop called a lyra, suspended from the ceiling. The studio in Paradise, where Hanes practiced circus arts and aerial dance, erupted in cheers. She moved through a series of gravity-defying spins and contortions. Her blonde hair — the ends rebelliously colored blue and purple — swirled around her. It was a triumphant dance, choreographed to a song called “Conqueror,” and in most aspects of Hanes' life she seems like one: she’s a full-time student at California State University, Chico, on track to get her bachelor’s degree in child development, she volunteers teaching toddlers and their caretakers at a local nonprofit, and she's raising a lively, happy four-year-old daughter on her own. But behind the assertive exterior, behind her toned biceps, 33-year-old Hanes has the medical record of a woman twice her age. She’s had eight surgeries for various ailments. She suffers from migraines, multiple food allergies and degenerating spinal discs. Her pregnancy was high-risk. She spent five years addicted to methamphetamines. Many doctors and researchers would not be surprised by Hanes' health record, given one risk factor from her childhood: serious, ongoing trauma. Hanes recalls moments of emotional neglect and abuse, finding her mother passed out in the bathtub from a drug overdose, and being raped at five-years-old. "You think it’s your fault," she said. "What did I do wrong?" Doctors began quantifying this kind of trauma in the 1990s, tallying up the number of adversities a young person experienced, and looking at the correlation between childhood trauma and health later in life. They found that the more adversity someone experienced as a child, the worse their health as an adult. This was not just because people who had faced childhood trauma were more likely to have mental health problems or engage in risky behaviors that are bad for health, which they were. This new research showed the damage was much more widespread than mental pain. People who had traumatic childhoods also had more physical pain and damaged bodies. A person who experienced major childhood trauma has four times the risk for chronic lung disease, two and a half times the risk for stroke, and double the risk for cancer. On average, their life expectancy is 20 years shorter than for a person without childhood trauma. “Childhood adversity changes the way that our stress response functions,” said Dr. Nadine Burke Harris, a pediatrician and founder and Chief Executive Officer of the Center for Youth Wellness in San Francisco. When Hanes looks through the list of ten potential ACEs, she tallies her score at eight. Trauma started early for Hanes with her parents’ acrimonious divorce when she was two-years-old, and the resulting custody battle that lasted years. In each parent's home, Hanes said she encountered challenges: a mother addicted to muscle relaxants and later, methamphetamines, and on the other side a father who, with his new wife and kids, belittled her. In both places, Hanes said she felt her parents weren’t there for her emotionally, which left her vulnerable to older kids and adults. When she spent the night at a neighbor’s house, she said she was raped by their teenage son. “You think it’s your fault: what did I do wrong?” she said about the experience. After years of these continued hardships, Hanes began harming herself. “I just felt like nobody really wanted me around. So, why don’t I just take care of that?” Hanes remembered thinking. Her first suicide attempt was at 12, and over the next several years, she thinks she tried to kill herself 20 more times, her last attempt at age 18. To move away from one kind of self-harm, Hanes started another: she became addicted to methamphetamines. “Basically from 18 to 23, I was addicted to meth and it's scary. It's a scary life,” Hanes said. Getting caught and spending time in jail forced her to sober up. She didn’t like the person she was when she was on drugs, and she wanted change. "When the Bear Comes Home Every Night"
Dr. Nadine Burke Harris has made it her mission to raise awareness about the long-term impacts of childhood trauma. In addition to leading the Center for Youth Wellness, she is a pediatrician who works with low income kids in San Francisco’s Bayview Hunter’s Point neighborhood. Her quest started with her young patients, who would come into her office with high rates of health problems like asthma, Attention Deficit Hyperactivity Disorder, and growth failure. She began to see a link between the kids' illnesses and problems going on in their homes, like an alcoholic mother or a physically abusive father. Dr. Burke Harris explains the science behind this idea in a popular Ted Talk. In it, she likens the connection between childhood trauma and bad health to seeing a bear in the forest. Dr. Burke Harris said when this hormonal cascade repeats, it seriously harms the body. The results of the first ACE study showed that they were incredibly common: of the people in the study, 67 percent reported at least one adverse childhood experience. What’s more, the population surveyed didn’t have a lot of the external stressors people may associate with a tumultuous home life: the majority were middle-class, 70 percent were white, and 70 percent were college-educated. Participants had access to quality healthcare through Kaiser Permanente. A person with four or more ACEs (which is considered substantial) is more than five times as likely to experience depression, has four times the risk for chronic lung disease, two and a half times the risk for stroke, and double the risk for cancer. To help people recover from trauma, experts encourage a wide range of strategies, like therapy, building healthy relationships, and practicing stress reduction techniques, like mindfulness and exercise. They say that applying these interventions during childhood is the most effective way to improve long term health, but identifying and addressing ACEs at any age can still be helpful. Sabrina Hanes’ life is an experiment in which this will play out. Hanes has been sober since she moved to Paradise, California, ten years ago, and she’s gotten her criminal record expunged. She’s turned things around, working toward educational and life goals. To do these things, she’s had to learn to build healthy relationships with those around her. She’s found mentors in her school programs, and through a community nonprofit called Youth for Change that’s taught her parenting skills. Her motivation has come from her own desire to change, a renewed relationship with her mother, and the help of Youth for Change social workers, who are versed in ACEs. Hanes also enhances her life through other stress reducing behaviors doctors recommend: healthy eating, regular exercise through her dance group, and paying attention to her mental health. Beyond taking care of herself, Hanes has had to learn to parent differently than her mother and father. ACEs are tricky this way — their impact can be passed from one generation to the next. Hanes addresses this through Parent-Child Interaction Therapy (PCIT), which she attends with her daughter Aroara. PCIT is intended to improve communication between kids and their parents, and minimize behaviors like tantrums and aggression in kids. At one of their sessions, mother and daughter sat together in one room, playing with a big stuffed bear, a toy stethoscope and Band-Aids. Therapist Laurie Taylor observed them through a fake mirror. Taylor spoke into a microphone that fed into an earbud Hanes wore. Aroara, however, could only hear her own mother. The two worked on addressing fears Aroara has when she goes to the doctor. Taylor coached Hanes through the experience, feeding her helpful lines. “I know that next time we go to the doctor's office you're going to be able to keep your body calm,” Taylor whispered to Hanes, who spoke it to her daughter. This kind of therapy is just one tool that helps families who’ve seen trauma. Sabrina Hanes said knowing her high ACE score helped her cope with the trauma of her childhood. Now Hanes is a mom, a student, a teacher. She volunteers at a local nonprofit teaching classes for toddlers and their parents, incorporating healthy eating, education, and social and emotional growth. She’d like to run her own preschool in the future. She wants to be there for kids who may be going through what she did. At the end of one of the classes she teaches, she reads the children’s book "We’re Going on a Bear Hunt" to a semicircle of mothers with young kids on their laps. The message of the book repeats page after page, that when confronted with an obstacle, the characters can’t skirt around it: they must go right through. On the morning of Thursday, Nov. 8, Hanes smelled the fire. She saw large ash, similar to what she’d seen just months before when the Carr Fire swept through nearby counties. She and Aroara had evacuated their home a handful of times in the past, prompted by an official alert. Receiving none, Hanes slowly packed with Aroara in case they would need to leave. In the past, evacuation traffic had been awful, she said, and she didn't want to add to it if it was unnecessary. Five harrowing hours later, Hanes and Aroara arrived at a friend’s house in Chico — that drive would normally take them 20 minutes, Hanes said. Hanes and Aroara were then evacuated a second time around midnight to a more central part of Chico. For the past week, Hanes and Aroara have been staying with friends in Chico. They arrived with two small backpacks of clothing and one photo album. They did not have time to find their cat before leaving. The home Hanes rented for years has completely burned down, and she did not have renters’ insurance because she could not afford it, she said. “We hear that God doesn't give you anything more than what you can handle. But I feel like I'm questioning that right now,” she said. Chandra Ghosh Ippen is a psychologist and Associate Director of the Child Trauma Research Program at University of California, San Francisco. In addition to studying childhood trauma, she’s authored several free books for kids and their parents that address traumas, including one about wildfires. Ghosh Ippen said that while people with high ACE scores will all react differently to new trauma, the fire will likely be worse for them than for those who’ve had less trauma in the past. Ghosh Ippen said it’s important that our community and country respond seriously to those who’ve been impacted by the wildfires. Knowing that people are aware of their loss and reacting to it can help wildfire victims. Ghosh Ippen listed several other ways people can help those impacted by the wildfires: meeting their basic needs through food, clothing and shelter, guiding people through disaster relief systems, holding a space for grief and opportunities to take care of their mental health. Hanes doesn’t know what will come next for her and her daughter. She feels pulled in many directions, between looking for new housing and helping Aroara process all that they’ve lost, from the big things to the small, like the presents for Aroara’s upcoming birthday.